My newest book Chi Iota Sigma reveals that a major mistake was made in Christianity around 1800 years ago. That is when early Christian priests began to try to decipher the cryptic message of what is now known as Revelations 13:18. A fragment of this text was found over 100 years ago along with thousands of other ancient text fragments, but it was not until 2005 that new techniques in photography were used that allowed the ancient papyri to be read. The fragment is known as P 115. I’m the first scholar to actually be able to show what the letters are and what the number really is. For most of the past 2,000 years readers of this scripture have seen words for either 666 or 616 in their bibles. 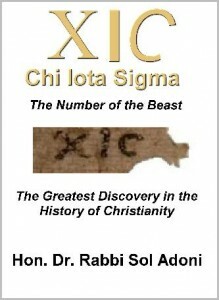 The earliest text used three letters and the letter are XIC. They literally look like our modern alphabet for XIC which is also the Roman alphabet. While the original New Testament scripture was written in Koine Greek, these three letters were said to be a number. All academics looking at this fragment assume the letters are Greek and they have come up with wrong numbers including 666 and 616. The numbers were the most popular number system in the world at that time, that being the Roman numeral system. It’s that simple. Although Greek was the majority language for writing in 81 A.D. or so when the text was written, Roman numerals ruled the world for counting since Roman coins were the majority money system in the world at that time. So a person in that area used Greek for letters and writing but used Roman numerals for math. XIC is CIX in reverse or 109. In Hebrew Kabbalah the number 109 is associated with a word that both Ezekiel and Jesus used for a beast. In Ezekiel 1:14 the prophet Ezekiel described the creatures of his ‘UFO’ as LIGHTNING or BZQ (Bazaq). In Luke 10:18 Jesus literally described SATAN as LIGHTNING, which can be BZQ (Bazaq) or BRQ (Barak/Baraq). So when John of Revelations described the BEAST he hid a word that both Ezekiel and Jesus used to DESCRIBE THE BEASTS of Ezekiel and SATAN by Jesus, that being lightning. Here is the fragment known as P 115 and any child familiar with our modern alphabet can see XIC or CIX in reverse is THE TRUE NUMBER OF THE BEAST. Here is the Roman numeral value. Oh, I also explain in my book the nonsense about Nero being 666 is false. First Nero died 68 A.D. and Revelations was written at least 13 years later, so Nero was dead. To get to 666 the wrong number anyway, the idiots doing Gematria or Kabbalah have no clue as to how it was done, the use an extra N in Nero spelling it NERON. Now in Kabbalah a final letter N is not 50 as the first N is in value, the final N is one of five ‘finals’ in Kabbalah and has a value of 700 that one letter alone, so the idiots doing these analysis are clueless twits that can’t read Hebrew and they know nothing about Kabbalah and Gematria. 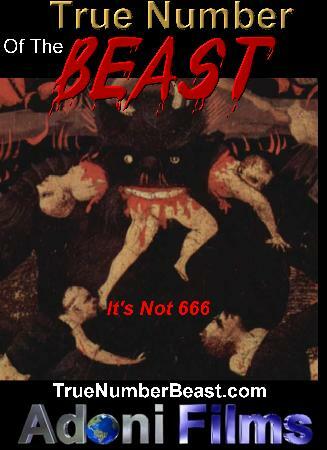 The reason that both 616 and 666 are not the numbers are numerous. First if the letters are not Roman numerals, which they really are (Roman numerals), then the letters are not 666 or 616 in Gematria anyway. The final letter that looks like a C is not a Digamma it was a Sigma in ancient times. Why did this number get confused? Well the Roman influence on early Christianity forced a lot of Roman ideas on Christian scripture and 666 would have been a great number to oppose the name of Jesus in Greek which some believe is 888. This 666 versus 888 is pure Roman numerology which took control of Christianity after Constantine took over the religion for Rome.